Mandana got upset and complaint to captain Suyyash citing the Digangana’s behaviour and Kawaljeet’s way of eating at the middle of the night. At first, Suyyash tried to ignore her request. When it happened, she, herself, proceeded to face him. She tried to convince him to move out of the room and have whatever he wanted. But, Kawaljeet rejected her request. Then, Suyyash tried to join the conversation and became a part of it, but soon he decided not to intervene the personal matter of Mandana and Kawaljeet. After that, Kawaljeet reached to the garden premises when he found Kishwer seating inside the car. Soon, Rochelle joined the conversation and defended Mandana that all the housemates had decided with the common consensus that nobody will eat food inside the bedroom area. It caught fire soon and an argument got ignited between Rochelle and Kawaljeet. Next morning, the housemates were made to wake up to the track Aaja Mere Gaadi Mein Beth Jaa citing and reminding of the on-going car task in which Rochelle, Prince, Priya, and Kishwer were left yesterday. All of them have been seated inside the car throughout the night. Priya tried to send Prince outside of the car by making him touch to the floor. Howeve, he woke up at the right moment and saved himself. Then, Kawaljeet tried to instigate Rishabh against Mandana citing that Mandana’s friendship with him has been seen as a fake one. On the other hand, the car mates were trying to put Rochelle out of the car as she wasn’t feeling good. Thus, they encouraged her to quit the task. When Suyyash tried to convince her, she rejected it citing that they are cashing their chance to reduce the competition. However, Kishwer said that she will company her if she left the car. Proceeding further in the day, BB introduced a new twist in the car captaincy task. It was that the housemates outside the car had to irritate the mates sitting inside the car to an extent that they leave the car and step out of it. The contestant surviving the longest will become the new captain. Prior to getting started with the twist, Priya urged to set some basic rules like nobody will force anybody physically to move out of the car. On Bigg Boss 9 Day 47 Episode 47 27th November 2015, after sometime, Prince was spotted caressing the feet of Priya, to which she reacted and said that he was doing a sexual act. Following this statement, they got involved into war of words. Moreover, she taunted Prince for displaying inhuman behavior in every task. After a while, Kishwer tried to throw Priya out of the car. In return, Priya picked up the bottle in which she urinated earlier. After picking it up, she threw contents of the bottle on the face of Kishwer. In return, Kishwer used insect spray to take revenge. Later in the day, Rishabh and Mandana had one more ugly fight in which Mandana abused him once again. Proceeding next to Rochelle, he decided to cut her seatbelt in order to force her outside the car. He didn’t stop here. He even tried to jerk her leg and touch to the ground in order to disqualify her forcefully. However, he wasn’t successful but hurt Rochelle physically. The supervisor of the task came to her rescue. However, Mandana’s support didn’t much and Rochelle ended up in quitting the task following the pain. She deboarded the car. Then, after sometime, Priya vibed that Prince is getting maximum support, but she decided not to quit and stay in the competition. However, the major twist came after that when BB opened the doors of the house to let contestants leave who wanted the same. Priya Malik won and became the new captain. 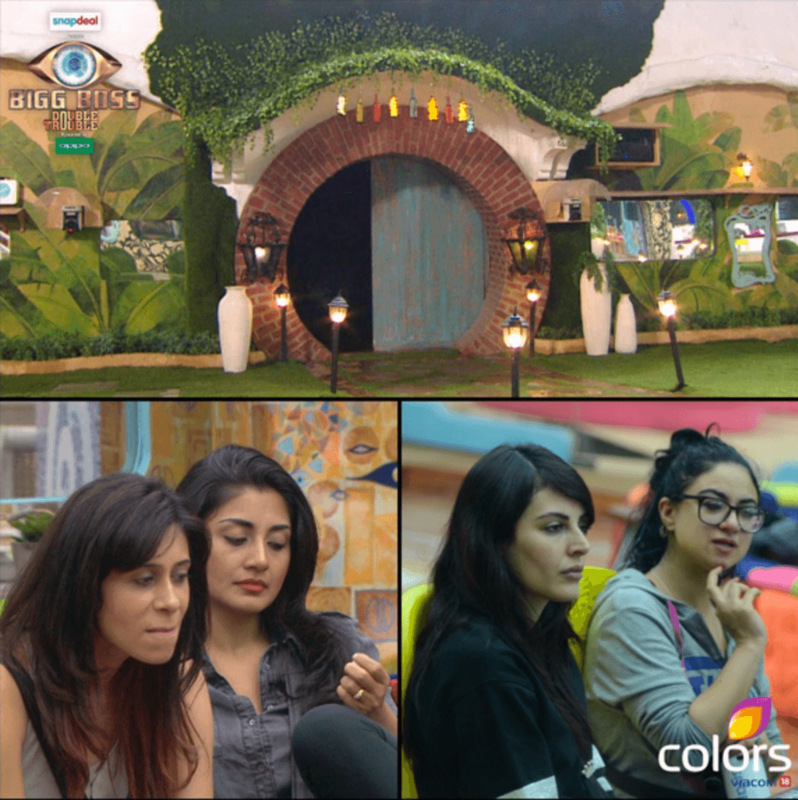 Bigg Boss 9 Day 47 Episode 47 27th November 2015 ended. Let’s see tomorrow what happens next. Stay tuned for latest news and BB9 updates.